If you are preparing for a career in air traffic control, you can expect fierce competition for a job within the field. With high pay, good benefits, and rewarding job prospects, an ATC career is highly desired. You can gain an advantage on the competition by successfully completing the AT-SAT, the exam administered by FAA-approved programs. Air Traffic Control Test Prep will help you master the fundamentals you need to start your career in this exciting field! This comprehensive guide provides you with extensive practice (800+ questions!) for the question types you will see on the exam. Though the practice tests within do not exactly align with recent test changes, the questions in the book will be very helpful in practicing for such a complex and extensive test. Inside you will also find explanations of: *The nitty-gritty of air traffic control systems*Navigation systems*Airways*Communication*Surveillance*Interpreting weather forecasting*Mapping airspace*Airport information*And more! With the number of increasing worldwide flights and a large percentage of the current ATC workforce set to retire, this part career guide, part question manual offers A-to-Z guidance in a field booming with opportunity. If you are preparing for a career in air traffic control, you can expect fierce competition for a job within the field. With high pay, good benefits, and rewarding job prospects, an ATC career is highly desired-but you can gain an advantage on the competition by successfully completing the AT-SAT, the exam administered by FAA-approved programs. How do you develop the skills to earn the best score possible for this important exam? Master the fundamentals with Air Traffic Control Test Prep. This comprehensive guide to the exam provides you with all the vital test preparation you need to achieve the best results! 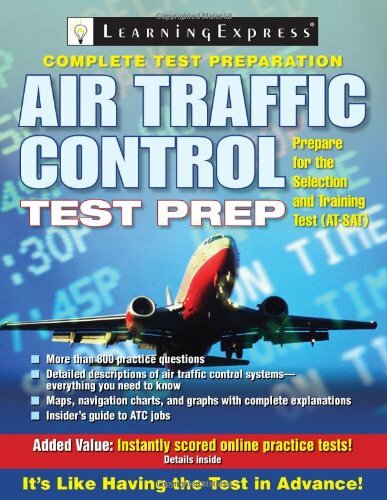 This book includes: Explanations of the nitty-gritty of air traffic control systems-navigation systems, airways, communication, surveillance, interpreting weather forecasting, mapping airspace, airport information, and more Online access to practice tests with thorough answer keys 800 practice questions-more than any other guide on the market! Maps, navigation charts, and graphs with complete explanations Descriptions of the differences in the ATC jobs-control tower vs. terminal radar approach control (TRACON) vs. air route traffic control center (ARTCC) Info on salaries, benefits, and opportunities in the field A glossary of terms and a helpful list of employment contacts With the number of increasing worldwide flights and a large percentage of the current ATC workforce set to retire, this part career guide, part test prep manual offers A-to-Z guidance in a field booming with opportunity.